An overcast sky, predictions of rain. A lazy Saturday morning for the populus. But we at Toybank were active, for today was a special day. Today we had a distribution even at Ville Parle Municipal School. We reached the school as early as possible with 4 boxes full of toys and very soon all the volunteers from Morgan Stanley (our partners for the event) gathered and the entire team met the co-ordinator for the distribution right outside the door. While at the door, we could see students still filtering in, and while they didn't know that we were from Toybank or that they were to receive toys, the smile on seeing the boxes of toys was unmistakable. We finally entered the school and the quaint looking structure suddenly changed into something impressive. The team moved upstairs and we were seated in a classroom, and one could see the volunteers remniscence their own school life. After a few minutes of informal chat, Ruta (our very own Toybanker) started with the orientation. First was a round of informal introduction, where the Toybank memebers were introduced to the Morgan Stanley volunteers and vice versa. Next we were briefed about activities that were going to take place, and we all instantly knew that it was going to be a fun day. So, some smiles and an orientation later, we found ourselves in another classroom, only this one was full of kids waiting in anticipation. It is said, “One smile is enough to cure a thousand tears”. If that were true, then the smile these kids gave on seeing us with so many toys, can surely cure all the sadness in the world. We started with introducing ourselves to these children. A couple of volunteers had brought their kids along, and the energy and enthusiasm that these kids were displaying was something of motivation to all of us. Completely envigored, we started with our ice-breaker activity. The first activity required groups of 2s, and each member would have to introduce his/her partner and vice versa. The activity took a sudden turn to humor, when we discovered almost everyone's favorite food in the room was Pani Puri. However what captured us the most about the introduction session was that each kid present there aspired to be something, something big. A clear departure from the standard engineers and doctors, today we heard everything from musician to F-1 driver. While some of the ambitions are nothing more that mere naievity, it is the zeal with which they work to keep this ambition alive, is what moved us and somewhere instilled a sense of respect for these children in us. Once we saw all the kids gelling together and feeling free and comfortable, we started with the actual games. The first game was a know your team game, wherein 4 groups of 10-12 children were made, and they were asked to list down 10 common things between themselves. Each group assigned a leader automatically whose task was writing the points down and co-ordinating the activity and at the end announcing these points to the others. When the children started with their heated discussions, we seized the opportunity to set up things for the next activity and ofcourse, take some snapshots of this amazing gathering. The leader of the first group stood up after some time and started reading out the list. Any guesses on the first point? Pani Puri ofcourse. After that we heard almost everything from burger to cricket to music to “we like studying”. Once all the 4 groups were done, there was a round of applause in the classroom for this wonderful activity. Now was the time for the most interesting activity of all: Math Circuit. There were 20 papers around the room divided into 2 parts by a horizontal line, with the first part containing an algebraic expression and the second one, a number. The answer to the expression was present in the 2nd part of some other paper. The challenge required solving a question, locating its answer and solving the question on that paper. The beauty of this game lies in the fact that if one solves each question correctly then he/she would complete a full circle and return back to the first question. This was an individual competition and the children immediately set to work. The fun part was when the kids of the volunteers also joined the race and quickly started solving the expressions. 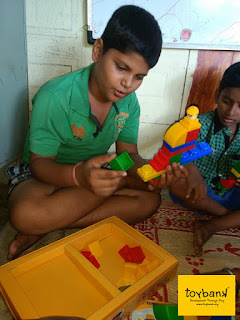 To our amazement, the students finished the activity quite quickly and with commendable accuracy and from the look on their faces, we knew this activity had been a big success. Looks like everyone loves a good old competition. Now was the time for the final activity, a fun filled craft activity. The item of interest was a paper crown. We distributed sheets of newspaper around the room. The volunteers displayed the procedure of making the paper crown, which was quite simple. However the trick was something else; one could put a couple of folds and turn this crown into a pouch or a Nehru Topi. The activity quickly gathered interest and the children started improvising. Almost all children came up with their own version. However, the most noteworthy was when a couple of guys turned the crown upside down, made a few folds and converted it into a very durable looking (golf) cap. Seeing such innovation is inspirational and somewhere along the line reassuring, the reassurance that the future is in safe hands. Finally, we started distributing the toys to the children. At the end of the day, everyone likes receiving presents, and so we had carefully wrapped each toy and gave one to each child. There were board games, soft toys, and almost anything appropriate for these children. These children looked really happy, and it is my belief that at these moments, one can truly appreciate the Toybank motto. We got some awesome snapshots of all the children holding their toys and of the volunteer team. 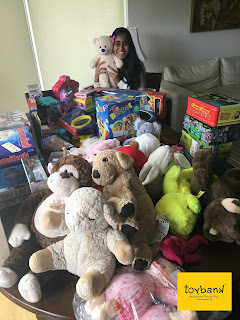 After thanking us for these toys, the children went back to their original classrooms and we thanked the Morgan Stanley volunteers for all the help, as this entire event would be next to impossible without them. We departed with a feeling that we would miss these kids but with an unusual happiness in our hearts. In the end one can only say “Life is not about happiness, rather it is about sharing of happiness”.